The aim of this paper is to describe the European context related to healthcare, and its implications for cross-border healthcare in Europe. The background information demonstrates the need for further research and development in this area. As a response to this need, the European Commission funded the Methods of Assessing Response to Quality Improvement Strategies (MARQuIS) research project. This article comprises two main sections: a description of the European context, and a description of the MARQuIS project itself. Citizens are increasingly crossing borders within the European Union (EU). The vast majority travel for reasons unrelated to healthcare. In some cases, these movements give rise indirectly to demands on health services, and in others patients may directly seek specific care services in other member states. Europeans have always been free to travel to receive care in other member states, but if they wished to benefit from their statutory social protection scheme, they were subject to their local or national legislation on social protection. According to article 22 of Regulation no. 1408/71, they could benefit from health services in another European Economic Area country, with access to emergency care during short-term stays. They needed, however, prior authorisation for elective care in another member state since the range of available benefits was limited to those covered in the country of insurance.1 This was challenged in 1991, when the European Court of Justice defined healthcare as a service.2 Consequently, in the well-known Kohll and Decker rulings of 1998, and subsequent cases, the European Court of Justice established a new type of cross-border access to health services in the EU. According to treaty principles of free movement of persons, goods and services, citizens should be able to go abroad for non-hospital care treatment at the expense of their statutory social protection scheme.3 Built on articles 28 and 30 (free movement of goods) and articles 49 and 50 (free movement of services) of the treaty, this jurisprudence urges member states to suppress barriers to fundamental freedoms. Those new rules apply to social insurance systems as well as to national health services, according to the Watts rulings of 16 May 2006. Except for particular instances, the level of suitable administration for a function remains the most decentralised level. The member states have thus decided that the state or regional level is the most appropriate for decisions regarding health. Consequently, Community actions with regard to social or health matters are only legitimate if they add to or strengthen those carried out at the national level. Based on this and up to now, the majority of Community legislation enacted in the field of health has not fundamentally transformed the way health systems operate in the countries of Europe, as the treaties have only given the EU very tenuous powers over health systems. This reflects the diversity that is at the very origin of European social systems, themselves reflected in the differences in the constitutional and administrative organisation of member states. And this diversity also holds within countries: the number of states in Europe which authorise regions to intervene appreciably in the field of health has markedly increased in the past 30 years. The content of regional health powers is itself variable. It may be minimal, as in the implementation of national health legislation and the management of part of the health system, or maximal, as in decision-making powers for regulation, health planning, financing and the supply of hospital care. With particular reference to hospitals, major differences in systems may be measured with a few key elements. First, the means of access to hospitals can be very different from one member state to another. National hospital structures are also highly varied, especially in terms of the division between public and private, and within the private sector, between for-profit and non-for-profit organisations. As this concerns the burden of public hospital costs within the national total health budget, such differences in the organisation of systems cause significant budgetary differences. On further analysis, it is also clear that the models of medical organisation, internal management and decision-making powers in hospitals are very different from one member state to another. Convergence is, however, growing for various reasons: cost containment, innovation, consumerism, ageing, etc. This is visible in policies for access, quality and financing of hospitals. The construction of the EU has itself been the basis of a number of actions, leading to a certain degree of convergence. Legislation is in place concerning drugs and medical devices, based on free movement of goods. The mutual recognition of professional qualifications is also particularly important in the healthcare sector, as a driving force of convergence. Article 152 of the Treaty of Amsterdam (1997) widened the powers of the Union with regard to public health by conferring on it genuine decision-making powers in certain fields. This is particularly true with regard to the quality and security of organs and substances of human origin and blood and its derivatives. In this context, patient mobility has become a relevant issue on the EU’s agenda. The need to respond to the jurisprudence of the European Court of Justice led to the creation of a high-level process of reflection on patient mobility in 2002 to discuss issues related to a growing number of patients in specific situations, including border regions, highly specialised care, tourists and people residing in another country. A high-level group on health services and medical care was set up in 2004 to follow developments. Various working groups prepared concrete proposals for the ministers of health about possible ways to improve cooperation and exchange of information between member states at the European level. In this high-level group, member states have been asked to debate issues of growing patient mobility, and to focus greater attention on cross-border healthcare. Some areas for attention thus far have been the provision of better information systems on spare capacity across the EU to reduce waiting lists for operations, conducting joint health technology assessment, creating European centres of reference for therapies involving advanced technologies and treatments for rare diseases, and the development of a common definition of rights, entitlements, and duties of patients at the European level. solidarity (linked to the financial schemes under which the health systems are funded). The principles also state that reducing health inequalities must be one of the aims of health systems, as well as a shift towards preventive measures. Following the exclusion of healthcare services from the Services Directive adopted in 2006, the European Commission was asked to work on a strategy for patient mobility that facilitated progress while respecting national responsibility for health systems. Again, the issue of the right balance between free movement and the responsibility of member states to protect their citizens and organise their healthcare systems was debated in the consultation process—which should lead to a directive in this field. On the research side, the EU has funded a number of Scientific Support to Policies (SSP) activities within the Sixth Framework Programme, with the aim of providing the evidence needed by EU policy makers to deal with issues that European citizens face as a result of enhanced mobility in Europe. The Europe4Patients project (e4p, 2004–7) explored the impact of an integrated Europe on patients, in terms of the potential benefits through developments such as greater access to centres of excellence, and actions that overcome transfrontier imbalances between demand and supply. The Health Basket project (2004–7) intended to provide information to national and EU policy makers on reliable comparisons about available health services in European member states, how these are defined, what their costs are and the prices. The MARQuIS research project we present in this supplement is one of the SSP projects that focused on cross-border care. MARQuIS intends to assess the value of different quality strategies, and to provide the information needed when countries contract care for patients moving across borders, and when individual hospitals review the design of their quality strategies. The results are intended to provide evidence-based advice for the further development of formal quality procedures at the EU level either for healthcare institutions or for developing existing approaches. patients who are sent abroad by their own health system to overcome capacity restrictions at home. Some patients cross borders within the framework of cooperative agreements in order to share facilities, especially in relation to capital-intensive or highly specialised services. To study quality of care in the MARQuIS project we chose the dimensions of quality of the PATH (Performance Assessment Tool for Quality Improvement in Hospitals) conceptual framework, developed by the World Health Organization (WHO) Regional Office for Europe,12 since it provides an up-to-date, comprehensive framework for hospitals, based on previous existing knowledge. The PATH conceptual framework advocates a multidimensional approach with six interrelated dimensions that should be assessed simultaneously. 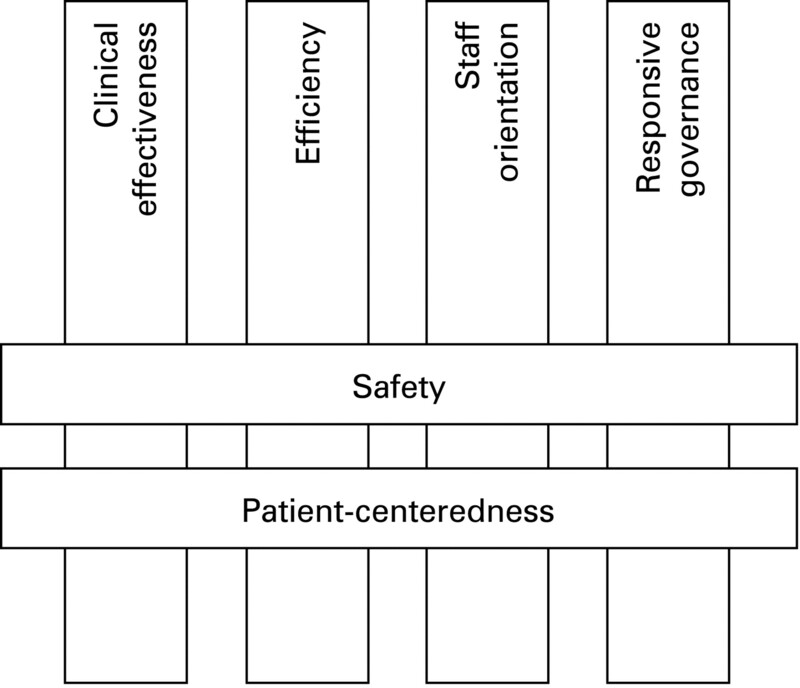 Two of these dimensions (safety and patient-centredness) cut across the other four dimensions (clinical effectiveness, efficiency, staff orientation and responsive governance), since they are inter-related. Figure 1 is a graphical representation of this framework. The MARQuIS project focuses mainly on the two central dimensions (safety and patient-centredness) due to their relevance and inter-relation with the other dimensions, and also explores clinical effectiveness. A multimethod approach involving qualitative and quantitative methods was chosen, and included literature review, qualitative studies, questionnaires and visits to centres to verify questionnaire data and obtain complementary information. To fulfil its objectives, the MARQuIS project was designed in four stages, to last for 3 years (2004–7, extended to June 2008). The information from each stage was to be used as the basis for the following stage. Figure 2 shows a basic scheme of the stages of the MARQuIS project. Figure 2 Scheme of the stages of MARQuIS project. AMI, acute myocardial infarction. The MARQuIS project collected self-reported data from 389 hospitals in eight European countries, and included an external assessment of 89 of these hospitals. In all, the study involved 16 European organisations (universities, accreditation bodies, scientific societies and federations) related to healthcare quality, and more than 30 professionals. In addition to the professionals directly involved in the project, an advisory council of more than 15 international experts provided recommendations to the research team. The scientific results and recommendations of this project are presented here. The successful completion of this project can be considered an accomplishment in itself. The multinational and multicultural approach favoured international information exchange, which in itself can contribute to self-learning and homogenisation of the work in different countries. This self-learning and homogenisation process seems crucial in the evolving European context. For this reason the authors advocate the promotion of further international research focused on the quality of European healthcare. Eur-Lex. Case C-159/90, Society for the Protection of Unborn Children Ireland Ltd v Stephen Grogan and others, 4 October 1991. Search via http://eur-lex.europa.eu (accessed 9 Dec 2008).
. Health and efficiency: community law and national health systems in the light of Müller-Fauré. Modern Law Rev 2004;67:94–107.
. Registration and supervision of health professionals in EEA countries. Maastricht: Netherlands Institute for Care and Welfare, 2004. http://www.nizw.nl/ (accessed 9 Dec 2008).
. How can quality of health care be safeguarded across the European Union? BMJ 2008;336:920–3.
. Trade in health services. Bull World Health Organ 2002;80:158–63.
. European health policies – moving towards markets in health? Eurohealth 2004;9:18–21.
. Moving to global standards for accreditation processes : the ExPeRT Project in a larger context. Int J Qual Health Care 2000;12:227–30. Organisation for Economic Co-operation and Development. Towards high-performing health systems. Summary Report. Paris: The OECD Health Project, 2004.
. International collaboration to address common problems in health care: processes, practicalities and power. Int Nurs Rev 2004;51:140–8.
. Patient mobility in the European Union. Learning from experience. Geneva: World Health Organization, 2006, on behalf of the Europe 4 Patients project and the European Observatory on Health Systems and Policies. World Health Organization. 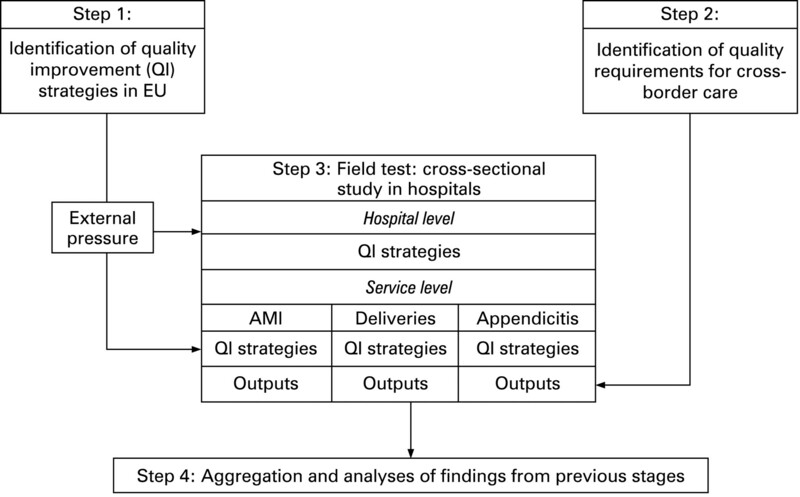 Performance assessment tool for quality improvement in hospitals. Copenhagen: WHO, 2007. http://www.euro.who.int/document/e89742.pdf (accessed 28 Nov 2008).
. National quality improvement policies and strategies in European healthcare systems. Qual Saf Health Care 2009;18(Suppl I):i22–7.
. Quality requirements for cross-border care in Europe: a qualitative study of patients’, professionals’ and healthcare financiers’ views. Qual Saf Health Care 2009;18(Suppl I):i15–21.
. Do European hospitals have quality and safety governance systems and structures in place? Qual Saf Health Care 2009;18(Suppl I):i51–6.
. Learning from MARQuIS: the future direction of quality and safety in hospital care in the European Union. Qual Saf Health Care 2009;18(Suppl I):i69–74.